On April 16, 2015, the Medicare Access and CHIP Reauthorization Act of 2015 (“MACRA”) was signed into law. 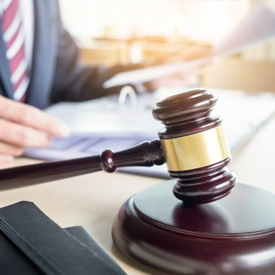 As part of this legislation, MACRA will prohibit the sale of Medicare Supplement policies that cover Part B deductibles to “newly eligible” Medicare beneficiaries, effective January 1, 2020. 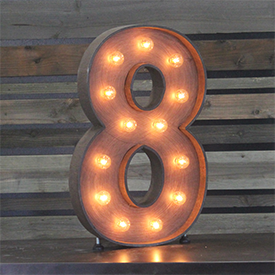 “Newly eligible” beneficiaries are defined as individuals who: 1) have attained age 65 on or after January 1, 2020; or 2) first become eligible for Medicare due to age, disability or end-stage renal disease, on or after January 1, 2020. Plans currently covering Part B deductibles include C, F, and High Deductible F. After January 1, 2020, these plans will be referred to as Plan D, G, and High Deductible G respectively. Do waiver states have to adopt these changes? Yes, waiver states (MA, MN and WI) must adopt these changes so that their Medigap rules conform to federal law. Why are plans “redesignated” for only “newly eligible” Medicare beneficiaries? The only difference between Plans C and F and Plans D and G is the coverage of the Part B deductible under Plans C and F. All other benefits are exactly the same for D and G. Since Plans C and F will no longer be available for “newly eligible” beneficiaries, it was necessary to redesginate Plans C and F as Plans D and G for these individuals. How are enrollees in current Plans C and F affected by these changes? Current enrollees (those eligible for Medicare PRIOR to January 1, 2020) can continue with their Plan C or Plan F and may continue to buy Plans C and F beyond January 1, 2020. Current enrollees will also be able to buy the new Plan G High Deductible plan on or after January 1, 2020. What changes are made to High Deductible Plan options? Since Plan F High Deductible cannot be sold to those “newly eligible” Medicare beneficiaries, a new Plan G High Deductible is created. When can the new High Deductible Plan G be sold and who can buy it? Plan G High Deductible can be made available beginning on January 1, 2020; “newly eligible” Medicare beneficiaries and current beneficiaries would be able to buy the new Plan G High Deductible. For high deductible plans, does payment of the Part B deductible count towards the plan deductible? For Plan G High Deductible; while the Part B deductible is not covered (reimbursed), in most situations, it does count towards the High Deductible plan’s deductible. If, in the rare circumstance the Plan G’s High Deductible is met with all Part A expenses and Part B Deductible expenses are then incurred, these expenses will not count towards meeting the High Deductible nor be covered expenses. For enrollees in the Plan F High Deductible Plan, the Part B expenses will continue to be covered. How does this change the way Plans C or F, and D or G, may be sold in the state? Insurers would continue to sell Plans C or F to current Medicare Eligibles on a guaranteed issue basis. However, “newly eligible” Medicare beneficiaries cannot apply for or purchase Plan C or F. The “newly eligible” would be offered Plans D or G on a guaranteed issue basis instead. All other currently available plans may continue to be offered to all Medicare Eligible. See all of the implementation materials for revisions to the Medigap model here, including the implementation guide, new plan charts for 2020, and a timeline. We will continue to monitor Medigap Revisions in 2020, and will provide updates as they become available. There is great uncertainty surrounding attempts to repeal, reform, or replace the Affordable Care Act (ACA). But as we’ve noted, market participants can’t afford to sit still. Regardless of what happens, there is one very significant sector of healthcare that is positioned to succeed in this environment of uncertainty: Medicare Advantage (MA). As baby boomers age into qualification for Medicare, members are more likely to opt for plans that have benefits beyond what Medicare has traditionally offered. As a result, MA will present a significant source of growth for insurers. But to access a substantial share of this profit, plans need to urgently invest in key differentiating capabilities. Some background: The federal government provides healthcare insurance for seniors through Medicare, which is administered by the Centers for Medicare and Medicaid Services (CMS). Although Medicare reimburses providers, it doesn’t cover all costs. This is where Medicare Advantage comes into play. Members have the option of purchasing MA plans from private insurers to cover out-of-pocket costs. The majority of Medicare recipients do not choose MA plans, either because they aren’t aware of them or because their preferred doctors may not always be part of the plans, but the numbers are growing. Based on CMS data, more than 32 percent of Medicare members in 2016 — some 19 million out of the 58 million total — enrolled in MA plans. But this is just the beginning. Analysis from Strategy&, PwC’s strategy consulting business, projects that over the next eight years, enrollment in MA will rise at a compounded annual rate of between 7 and 12 percent. Accordingly, we expect annual revenues for MA plans to rise from US$215 billion in fiscal year 2017 to more than $500 billion by 2025. The underlying growth of MA is good news for healthcare payors. But not all participants will benefit equally. Given the structural and market forces at work, the total number of profitable MA plans is actually likely to decrease even as the number of participants surges. In this winner-take-all market, between $10 billion and $15 billion per year in total industry profits will shift toward a smaller number of higher-performing plans. As they sign up more members, plans operating in the MA market in the coming years will have to grapple with a host of external and internal challenges to their profits. These include cost pressures, lower reimbursement rates, increasingly stringent compliance requirements, and the double-edged sword of performance-driven reimbursements. CMS conducts an annual assessment of MA plans based on performance in a range of areas, including patient experience, access to care, and clinical care outcomes. The results of this assessment are published as star ratings, with the best-performing plans receiving a five-star rating. CMS offers substantial financial incentives in the form of bonus payments to plans with a higher star rating. Additionally, a small proportion (i.e., up to 5 percent) of the reimbursement payments are tied to these quality ratings. As time goes on, CMS will be basing a larger proportion of its payments on the ability of payors to deliver specific results and improvements in health metrics. At the same time, customers will likely flock to those plans with the highest quality ratings. This will create a virtuous circle. We project that within three years, 73 percent of the total MA membership will be serviced by plans with four or more stars, up from 34 percent today. Aside from attracting more members, plans with quality ratings of four or more stars will continue to receive a significant portion of the quality incentives paid by CMS, and have the resources to offer more attractive plans and reinforce their brands. The resulting increase in profit — an additional $800 million to $1.2 billion annually — means they’ll have larger cash flows to deploy for further investment in differentiated capabilities and market-position enhancement. To achieve the desired performance levels and have a winning position in the MA market, insurance plans need to urgently invest in four key success factors. In the healthcare market generally, there is a shift from the traditional fee-for-service (FFS) model toward payment for value or quality of services rendered, rather than quantity. The value-based payment model ties provider payments to the outcome of services provided as part of an effort to focus more on patient well-being and decrease medical costs. For example, insurers are implementing value-based payment strategies through episodic bundled payments for conditions such as hip and knee surgery and maternity care. Overall, tying payments to values and outcomes should help healthcare plans reduce medical expenses through the elimination of unnecessary and duplicate services. The 2015 Medicare Access and CHIP Reauthorization Act (MACRA) is accelerating this shift by rewarding or penalizing Medicare providers (i.e., doctors and hospitals) through the addition of a bonus to, or subtraction of a fine from, their FFS payments based on the quality of care. As a result, Medicare plans will be able to negotiate rates with providers based on their performance. 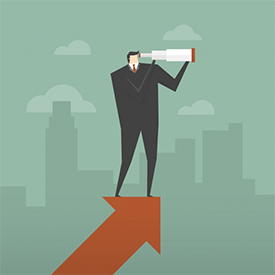 In order to thrive in the MACRA world, plans will need to provide scale and management capabilities to support providers through this transition, and to revamp their provider network and engagement strategies. MA plans can help physicians segue into MACRA-based payment models by equipping them with solutions and funding that enable them to perform MACRA-related analysis and reporting. Coordinating care for members is another critical differentiator for MA plans. Due to their age and health conditions, typical MA enrollees on average seek a lot more medical services across multiple avenues — physicians, labs, pharmacies, and long-term care — than younger patients. As reimbursement shifts to a value-based model, payors will need to find cost efficiencies by managing care through a “whole-person care” model. For example, by coordinating the care of a 70-year-old heart bypass surgery patient more effectively with the surgeon, hospital, and nursing home, payors can help smooth postoperative care and reduce readmissions. To forge a seamless care-delivery experience for the newly tech-savvy and empowered enrollees, MA plans can employ innovative and customizable models for integrated care coordination (e.g., cash bonus for enrollment in wellness programs) and through technology such as customized apps to track member health/wellness (e.g., tracking diets for diabetics). As compliance and regulatory requirements continue to become more stringent, plans need to deploy a three-step member-centric strategy to manage risk. First, they have to use data analysis to evaluate all member interactions across the company to identify the greatest risk areas for regulatory noncompliance. This can be done through by analyzing complaints and holding reviews of audits and internal processes. For example, timely member notification — such as the need to confirm receipt of enrollment applications within seven business days — is often an area of high risk for payors to ensure compliance with CMS requirements. Reviewing a single member’s experience with claims (as opposed to reviewing every process in the internal claims department) can be effective in identifying areas of concern. Next, payors must systematically address the most probable and highest-impact areas through both short- and long-term solutions that directly manage each high-risk member interaction. Finally, as plans implement solutions, they need to adopt a culture of continuous improvement that both extends and updates these solutions regularly. Member-centric risk management that aligns with the way CMS regards regulatory compliance offers several clear advantages. It can predict “hot spots,” or future areas of concern, such as changes in coverage that may result in barriers to care, before they become full-blown citations; it also can help management prioritize allocation of resources to areas that will have the greatest impact. More fundamentally, plans can identify and address root causes that typically span organizational boundaries. With the rapid increase in the number of baby boomers qualifying for Medicare, it is critical for MA plans to invest in differentiated member engagement capabilities. As noted, the number of customers for these plans is becoming more significant. But given the decades of experience these customers now have with online shopping, banking, and other services, their expectations for technology and user experience are increasing. Payors must review member needs across the spectrum of care as well as the services they provide and define new user experiences for each step. Doing so will allow plans to ensure member satisfaction, enable better retention, and reduce the number of member complaints, which are a significant driver of plan performance ratings. 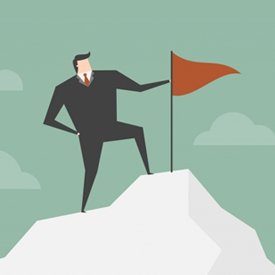 Each of these four differentiating areas is important for success in the MA market. But to truly succeed, payors will need to build a coherent strategy that holistically ties these four areas with a corresponding “way to play.” For example, a clinic-based care coordinator, such as Illinois-based Riverside Healthcare, can emphasize in-person care experiences and maintain a low-cost model by automating or outsourcing operations including compliance, all while leveraging MACRA principles for its narrow network design. A regional plan with large membership, such as Florida-based managed care company Wellcare, should seek to enhance the member experience by expanding its digital footprint while developing proactive risk management and operational excellence capabilities that ensure compliant and low-cost operations. Regardless of the path they choose, plans must begin investing in capabilities now. In the winner-take-all healthcare market of the future, passivity is not an option. I know some people who hate asking for referrals from their clients for fear of disturbing them or asking for “too much.” I understand the mentality, but I believe it is wrong. When you get your clients to promote your agency in a simple and uncompromising way, it’s doing them a favor. Why? Referrals are what we might call social currency. We all like to recommend companies and quality products because it is a way to help each other. I do not want your clients to lose the opportunity to make referrals, but at the same time, you shouldn’t have awkward conversations. If you do not convince yourself of this, your problem may be more complex than simply needing referrals. A referral bonus program is a system whose goal is to give value to clients who refer your agency. You can include different ideas, but the most important thing is that it must be a standard procedure, replicable and easy to implement. Having this program offers many advantages. » It will be easy to explain and replicate for your clients. » You are less likely to have an unwanted referral. » You can develop promotional material for your products (brochures, etc.). » Your clients will have an extra motivation to refer you and will be more willing to do so. If your clients do not have your contact information with them, they will be unlikely to refer you to their acquaintances. Initially, be sure to be among your clients’ telephone contacts. Then meet their family members and also have them in your phone. Work on this until each member knows you. Explain to your client the benefits of having their family members know your contact information in case of an emergency. This can even be done as early as the first sale. To the client, it will appear that you will be available to them at all times. For example, if you sell a policy to the mother of the family and she experiences an emergency, it’s important for other family members to have your contact info. In the blank space, write the name of your client and give it to them to pass to their contacts. One reason why your customers hesitate to refer you is because they do not want to look bad if they recommend your services and you are not the right fit for that person. Eliminate that risk by explaining the types of clients you serve and what you can offer them. Be careful about describing your clients with a profile different from theirs, as it will make them doubt if they are with the right agency. Here are two exercises that illustrate my point. Exercise 1 — Ask your client: Excluding your co-workers or family, think of someone you know who would be happy to make sure their loved ones are protected, or to have a financial plan for their retirement. Take time until you have thought of someone. Exercise 2 — Now think of a neighbor who would be happy to have those same services. The first question is more difficult to answer because the client will not know whom to refer. The second question has fewer options, and I bet you yourself imagined your neighbor thanking you for helping them. The point is, when you ask for referrals from your clients, ask them to think about a specific group of people from which it is easier to choose. The email signature is a block of text that automatically appears at the bottom of your messages. Most agents have their contact information and maybe a link to their website. This block of text is a good place to request referrals, because your client will be reading the email and can forward the information to their contacts. Use “Fwd my contact information” as your action message to remind the reader how to recommend you and above all, invite them to do so. When you receive referrals from a client, post it on your social networks for everyone to see while you thank the person who gave it to you. This accomplishes many things. It shows how much you appreciate their confidence in you. This will increase your chances of getting more contacts, and your social media followers will be able to see this. It also reinforces to your existing clients that other people are so happy with your services that they are inviting their friends to get to know you. This social test will improve customer perception and retention. LinkedIn has an interesting tool that can help you identify referrals. When you look at the profile of someone you do not have in your network and you are connected by a third person, LinkedIn will show you who that third person is. This means that you can send a casual message to the person you’re connected by to request to be introduced. If any of the ideas presented in this article are useful and you know someone who might appreciate it, please share it. You will be helping two people with a minimum of effort. Happy hunting. The Medicare Supplement market continues to offer long-term sustainability. Just over 75 million individuals are expected to be enrolled in the Medicare program by 2026 (a 32% increase over 2016). This means that by 2026 roughly 20 million more individuals will be added to the Medicare program with another 10 million being added by 2035. 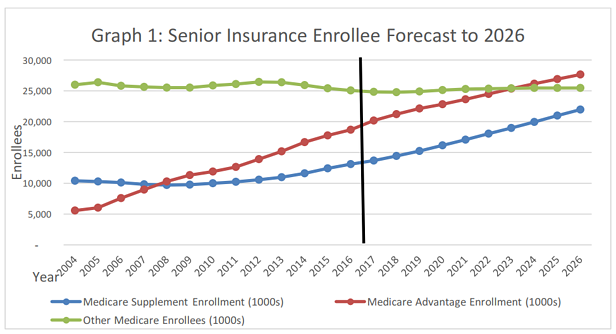 CSG Actuarial research indicates Medicare Supplement enrollments will continue to grow markedly over the next 10 years, creating ever-increasing opportunities for insurance carriers, agents, and marketing organizations in the Medicare Supplement market (Graph 1). There is a minimal amount of information available regarding Medicare Supplement market projections. CSG Actuarial has compiled data from various sources and developed actuarial models to project future Medicare Supplement enrollments and premium levels over the next 10 years. The Medicare Supplement market has a substantially lower proportion of disabled insureds than the Medicare Advantage market. Income distribution among products shows that Medicare Supplement plans typically appeal to insureds with higher annual income on average. The proportion of rural insureds who have a Medicare Supplement plan is significantly higher than the proportion of rural insureds who have a Medicare Advantage plan. The Medicare Supplement market has a higher proportion of healthier individuals compared to the Medicare Advantage market. About 70% of all Medicare Supplement beneficiaries live with someone else. The majority of carriers selling Medicare Supplement today offer some version of the household discount. To project the future of the Medicare Supplement market, we started by evaluating historical trends. Medicare Supplement policies in-force and premiums have rebounded the past nine years, fueled by an increase in annualized new premiums, which are up 91% since 2008. The increase in annualized new business premiums resulted in a leveling of the Medicare Supplement market penetration percentage from 2009-2013, followed by an increase in each year thereafter. In fact, the percentage of Medicare Beneficiaries who own a Medicare Supplement product increased 0.9 percent from 2014 to 2015, followed 0.8 percent from 2015 to 2016. The number of Medicare beneficiaries has grown by about 25% since 2008. Growth in the Medicare Advantage program has slowed, which left more lives in traditional Medicare with the need to purchase a Medicare Supplement plan. The average growth rate for Medicare Advantage plans over the past eight years is less than half the Medicare Advantage growth rate over the previous three years and has coincided with an increase in the Medicare Supplement growth rate over that same time period. The 2016 Medicare Advantage growth rate of 5.1% is the lowest growth rate since 2010. As a result, the annual growth rate of Medicare Supplement beneficiaries has been at its highest rate in recent years coming in at 6.9% in 2015, followed by 5.8% in 2016. At the same time, the Medicare Advantage annual growth rate of beneficiaries dropped to 6.8% in 2015, followed by 5.1% in 2016, bringing the growth rate of Medicare Supplement and Medicare Advantage closer than it’s ever been. As of last year’s report, Aetna’s proposed acquisition of Humana, and Anthem’s proposed acquisition of CIGNA were both getting increased regulatory scrutiny, with the U.S Justice Department suing to block the acquisition attempts citing concerns that the mergers would increase health-care costs and simultaneously reduce choice for consumers. Since that time, Aetna’s proposed acquisition of Humana, and Anthem’s proposed acquisition of CIGNA have both been called off. CSG Actuarial does not believe any potential merger consolidation will negatively impact the growth in the market. Based on our market perspective, at least 10 new carriers have entered or are in the process of entering the Medicare Supplement market in the last two years. We expect there will continue to be new carriers entering the market based on the favorable demographics, cost effective TPA solutions, sophisticated distribution options and reinsurers actively looking for new partnership opportunities. 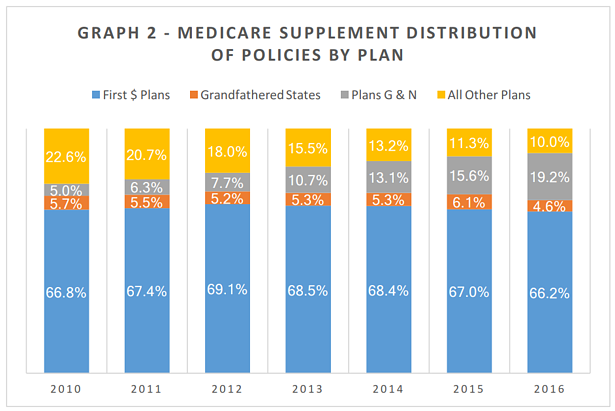 As commonly reported, Plans G and N continue to grow and grab market share in the overall Medicare Supplement market. In 2016, Plans G and N made up over 19% of the lives in the Medicare Supplement market, up from only 5% in 2010. A large portion of the growth in market share for Plans G and N is at the expense of non “first dollar coverage” plans, as can be seen in Graph 2. Recent results and future projections continue to suggest the Medicare Supplement market offers very strong opportunities for growth for carriers, marketing organizations, and agents. As covered in detail in this paper, some of the primary drivers of this future growth and opportunity will be 1) the overall growth in Medicare, 2) a decrease in Retiree Health Benefits, and 3) slowed growth in the Medicare Advantage program when compared to early years of Medicare Advantage. As the number of Medicare Beneficiaries continues to grow, from 57 million in 2016 to 75 million in 2026, it is becoming clear that those same individuals will increasing turn to private insurance (both Medicare Advantage and Medicare Supplement) to help cover their insurance needs. While some individuals will continue to receive Retiree Health Benefits, get coverage through Medicaid, or choose Traditional Medicare Coverage without any sort of supplemental coverage, these individuals will increasingly make up a smaller and smaller proportion of the total Medicare Beneficiaries. Beyond those primary drivers, CSG Actuarial believes other factors such as overall market stability and low barriers to market entry will also contribute to the future growth in the Medicare Supplement market. Stability in the market in recent years has been driven by lower claim trends that have led to lower annual premium rate increases and higher company profits. Low barriers to entry in the Medicare Supplement market are a result of numerous experienced TPAs, distributors and re-insurers available to provide support as needed for new companies wishing to enter the Medicare Supplement market. Adding it all up, CSG Actuarial believes future growth trends within the Medicare Supplement market continue to be very positive.